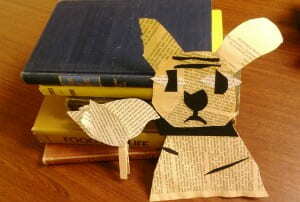 Upcycled crafts for National Library Week. Stop by the library’s 4th floor and repurpose an old book into a bird, a puppy, or a poem! And to celebrate National Poetry Month, check out the oversized magnetic poetry set on the library’s 5th floor. Happy National Library Week! Events will run all week, April 15th through April 20th.